Designed keeping in mind students’ hunger pangs, Unifyed brings foodie to campus – An on-demand food ordering app that brings food to students, faculty, and staff from restaurants near the campus. In 45 minutes or less, a cheesy Quesadilla, Chipotle bowl, or ultimate meat lover’s pizza can be on your lap, and not soon after, in your stomach. No more waiting in queues, you can now place orders for pick-up or delivery with just a few clicks. Foodie app lets you pick from a range of pocket friendly restaurants offering exclusive in-app discounts and deals. You can also save delivery locations, such as work or home, to speed up the process. Simply enter your location and view all the restaurants in your area. You can also search by cuisine or by a specific menu item. 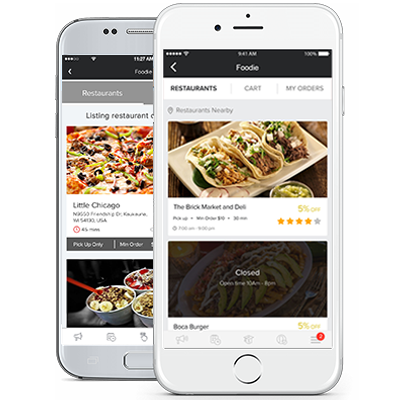 Foodie uses filters such as food quality, restaurant popularity, delivery time, and customer satisfaction to recommend the best restaurants in your area. Provides a cashless transaction through stripe payment gateway or COD depending on restaurants.